What's making you happy this week? I have a few things. 1. Apricots are in season. They are one of my favorite fruits. Their season doesn't seem to last long, and they taste awful out of season, so I try to maximize the month or so that they are in their prime. 2. Finishing the Superstition Mountain trilogy with the boys. It was fantastic. If you have elementary school aged kids, I highly recommend it. Mystery, adventure, treasure hunting, suspense, peril. It has a little bit of everything! 3. Chocolate herbal coffee. It doesn't have the bitterness of coffee. It's more like a tea. But it kind of tastes like chocolate coffee. I sampled it at the Earth Day festival in April, and promptly ordered myself a case. 4. Watching Cort practice his breakdance moves. I ordered him a used copy of How to Breakdance 1 and he watches it over and over and practices the moves. It's pretty cute. 5. Getting a grant to cover occupational therapy for one of my boys. The school was providing it to work on fine motor skills for a while, but then decided there had been enough improvement that it was no longer needed. I felt like he could use a bit more, but our insurance doesn't cover it, and at up to $200 a session it wasn't in our budget. I applied for a medical grant through UnitedHealth for kids under 16 with private insurance that doesn't cover certain therapies. When I got the email that we had received the grant, it brought tears of gratitude and relief to my eyes. If you have a child that could benefit from a medical grant, you can go read about the process and qualifications HERE. And feel free to email me directly if you have questions. Readers, what are your little happies this week? Getting the grant is wonderful news Lisa, I'm thrilled for you! Love your happies- I have been journaling mine lately! I haven't heard of these grants- I think that is SUPER! Congrats on the grant Lisa--those can be very helpful to families. Breakdancing video, huh? My kids would love that. They watch all the dancing stuff on youtube already. I looked at Apricots yesterday and thought pie. Great news on that grant! I hope your son continues to improve with continued therapy. I had no idea that UHC had such a program. Thanks! oh i am so happy your grant came through! you'll have to video cort and his moves! the tea looks good! thanks for linking and have a great weekend!! Such a huge blessing to have received the grant; United Healthcare is great insurance in so many ways. SO happy that happened! Bless you all. Have a wonderful weekend. You go, Mom.... happy the grant went through. Our children are our most important thing in life. We need them healthy, happy and busy. I did not know about the grant either, and thankful you applied and got it. I love apricots but never think to buy them. Your dancer will be thrilled with the new video. My happies this week would seem weird to most, but to me....:-):-):-) My DIL moved all of her things; my son and grandson are on the beach at Gulfport, and Jim and I got a clean bill of health from our doc yesterday. Happy Friday! Happies of all sizes are good! #2 I'll have to see if my grandkids know about this. They tell me that they know everything. #3 I'll stick with water, thank you. #4 I'd like to see this. #5 Aren't insurance companies just great. awesome news on the grant!! good for you for not giving up! Congratulations on the grant. I'm intrigued by that coffee. thanks for showing a picture of the tea box - I'm going to find some . . Such a great practice to look at these little happies. So glad about that grant. 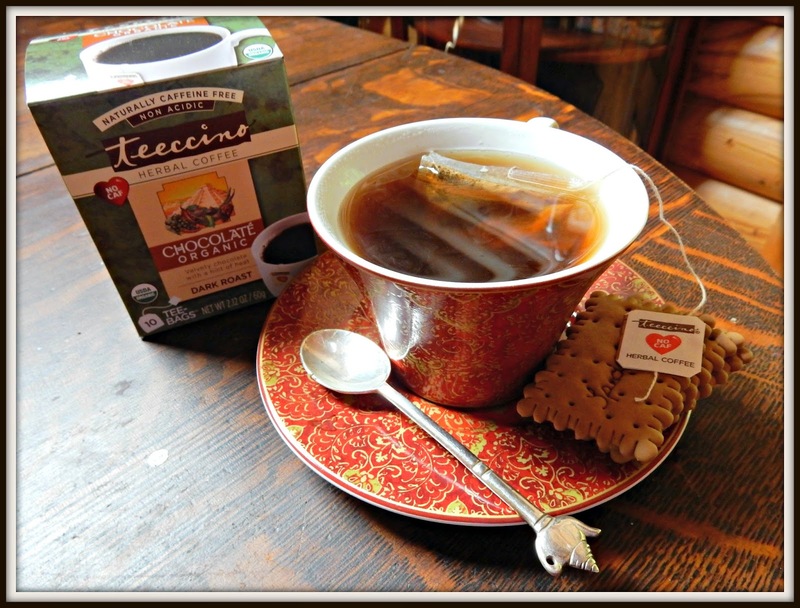 My little happy is discovering that tea/coffee/chocolate on your blog! Thanks for sharing... going to see if I can find it for sale online. Yum! And good for you, for being a great advocate for your son. I found the tea on Amazon! $28 for 10 teabags I think. Will let you know what I think of it, looks delicious. I had never heard of a medical grant, but glad you received it. So glad to hear you received the grant! I know I would love that Chocolate Herbal Coffee! I have a lot of k-cups for my Keurig that have chocolate flavor in them. Congratulations on receiving the Medical Grant!! Yay on the grant! I didn't know something like that existed. You are definitely a good mama bear to never give up. The tea sounds great--that's new to me too. I'm always on the lookout for a hot drink that isn't bitter. Hi Lisa, this is my first time playing in Tanya's Friday link-up party and so it's my first time visiting you. I big hello! :D The chocolate tea sounds interesting... but then how can anything with chocolate in the name be bad? LOL! Most importantly though, congratulations on no. 5 on your list. I hope it does the trick for your child! I like the sound of the chocolate coffee! YES! So glad you got the grant. That is wonderful news! I've been squeezing lemons in a container, and adding tea to it. It ends up tasting pretty good. That makes me happy. The chocolate herbal coffee sounds good. I would like it in an herbal tea. Good job in getting the grant!!! The chocolate coffee sounds yummy! Your such a good mom! 1. I'm not a fan of apricots in or out of season. Although I do like them in baked stuff. 2. Those books sound like something Coleen would enjoy. I'll see if our library has them. 3. Chocolate Coffee...hmmmm it sounds a bit odd. 4. I bet it's cute to watch him break dance. 5. That is great news. That's wonderful news about the medical grant! Yes, great news about the grant! I finished two books and that was satisfying to accomplish. I never try chocolate herba coffee before, sounds interesting. Must try if I can find one.